It's September 24, 2004, at a run-down club named Annie's in Cincinnati, OH. Starz is on a mini reunion tour and once again, history repeats itself: complete lack of promotion. A disappointingly small yet feisty crowd of around three dozen diehards, many of which had driven down from the huge, jam-packed Cleveland show the night before, shuffle in. The local opening act finishes their set, the crowd still has not grown larger and it's nearly 11:00PM. Any other band likely would have either cancelled this gig, or mindlessly gone through the motions with a vastly abbreviated set list. And who would blame them? But this band takes the stage and launches into a blistering set starting with "Live Wire", "Detroit Girls" and "Fallen Angel". To watch them, you get the impression they think it is still 1978 and they are playing to another packed 12,000 seat arena. I specifically remember standing back and thinking "Are they completely oblivious to the fact there are so few people here?". The intimate, enthusiastic crowd of diehards dance, sing and pump their fists in the air to the beat all night long, and the band feeds off the vibe and energy emanating from them. By 12:45AM, it's time for the encores. A fan jumps on stage. Then another...and another. With a huge smile on his face, Michael Lee Smith waves an invite and within seconds, nearly everyone from the audience is now literally up on stage singing with the band! Fans and band members alike are looking around at one another collectively thinking "Is this really happening?!" 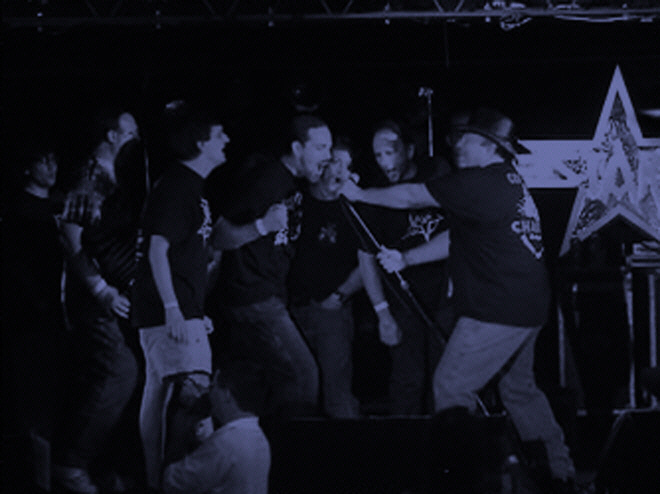 as they belt out a couple of encores in what can only be described as some sort of ultimate karaoke dream come true. As I watch all this unfold, I pause to realize: "This takes the cake! I am now witnessing perhaps the single most memorable performance I have ever seen by any band...EVER! This very night in Starz history completely epitomizes the genuine 30+ year love affair between Starz and its loyal fans. This is truly everything rock-n-roll should be about." So often I hear band after band publicly make cliché statements about how much they "love and appreciate their fans", yet rarely offer any real avenue of accessibility, unless there is a $400 meet-and-greet package involved. I had so very many questions at the outset of this project. Without exception, every member of Starz, both past and present, warmly and eagerly went out of their way to participate and contribute. I can personally attest as a longtime fan/collector/historian, this is completely, utterly and unbelievably unique. Thank you all for your patience, support, enthusiasm, encouragement and graciousness ... and of course ... for your wonderful music!! "Pieter and I were members of the band "Looking Glass". Looking Glass was essentially a fraternity band out of Rutgers University in New Brunswick, NJ that got stupidly lucky...right place, right time, right sound, right song. The Looking Glass that had the hit song "Brandy" in 1972 was actually the second version of that band. In an earlier version, Pieter played rhythm guitar and they had a different bass player and drummer. The second version of Looking Glass was as poor as church mice. Holed up on an 86-acre farm in northwestern New Jersey to write songs. The band existed on a few gigs a month and food stamps. When Looking Glass signed with CBS, they gave us all an advance against future royalties. None of us had ever seen that much money before. Everyone went out and bought new gear on 48th Street in Manhattan. The signature model stuff didn't come until the STARZ days. 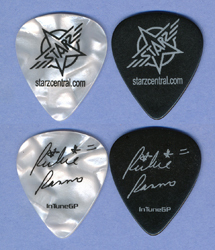 At one point, Pieter was considering using the stage name of "Rock Bottom" on his picks but in the end, he used Peter so as not to confuse anyone." "We did a reunion CD entitled, Requiem. We just rehearsed and recorded but never did end up doing any live dates at that time. 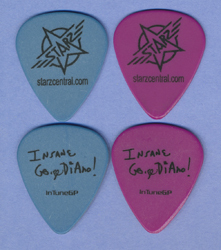 I had these picks made up in anticipation of the tour. Unfortunately, 4 gross of them were stolen from me." "Back in the day, I had my own 'Joe X. Dube' model that I had designed myself. I went down to the Cappella Stick Company [who went out of business a few years ago] in Hightstown, NJ, with Steve Whyland (our head roadie), met with their master wooded stick lathe-turner, brought a few samples of other sticks to show them what part of them that I liked and they turned out a version right there that was perfect for me. I used to get 100 matched pair sets sent to me at a time while we were out on the road. I was never w/out my brand. They were great for flinging out into the crowd (cautiously, so no one's eye would get poked out) or bribing radio station personnel or for trading for "favors" backstage. My model was longer that most sticks as I like to hold the stick pretty far back so as to create as much whip/leverage/stick speed as possible (that's how I get so loud!). It had a medium thick shaft that stayed consistent until the gracefully shaped shoulder, a medium thick neck and a rounded oval wooden (not nylon) head tip. I don't have any more of those but I wished I did just to have in case I ever get the opportunity to make it again. "These were the first Starz picks I had made up since 1992. Now that we were going to do some reunion gigs, I ordered them - black and yellow - just like the 1st album. 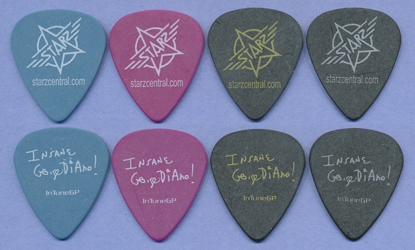 The first batch had the logo going the wrong way so I had the pick company re-do them correctly on the next order." 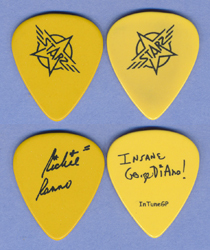 "I was SO excited to get my name on a Starz pick, official yellow Starz color too. Kinda like a dream come true...a validation of sorts!" 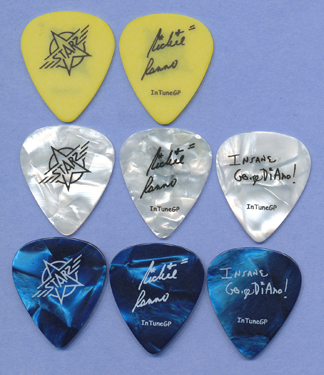 "As for the blue pearl, white pearl and yellow - this was the first time I used a pearl pick. All my picks are heavies. I don't like one specific pick. I like to have a variety of different plastics - as long as they're heavy gauge." "These were cool, a neat getaway from the classic yellow and black...but the picks are brittle...not thick enough, I am a hammerer on the bass, they crack in half after 2 or 3 tunes." 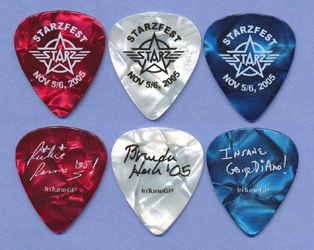 "For those [StarzFest] gigs I switched to an extra heavy Fender or Sam Ash pick. Thought that might help me cut through the sonic barrage a bit better, but it didn't." "I loved the purple and blue ones so much, I decided to get some with white illustration, just to change it up a bit. 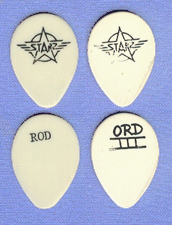 These picks are awesome. Again, they never snap, and the illustrations don't smudge, even from the heaviest thumb-sweat!! !